This does not contain spoilers for Rogue One: A Star Wars Story. It may not be exactly what some fans might have asked for, but Rogue One: A Star Wars Story is the movie that the franchise has needed for a long time. Set between Episodes 3 and 4, Rogue One follows the exploits of Jyn Erso and the rebel alliance as they steal the plans for the Death Star and set the events of A New Hope into motion. While the film stops, starts and goes where you might expect, it never let’s up in its efforts to make the Empire-ruled galaxy the original trilogy scratched the surface feel bigger than ever. It never feels like an exaggeration to that it’s everything the prequels should have been. While very different to last year’s The Force Awakens, it almost feels like a reaction or response to the more-legitimate criticisms that J. J. Abrams’ movie was dealt. It certainly plays off the franchise’s history, but the bulk of the story that plays out here is driven by entirely new faces and factions. Rogue One injects Lucas’ creation with new idea after new idea, refreshing and rejuvenating the material – no matter how far away or long ago it takes place. Ever wondered how the Empire’s internment camps operated? Rogue One will deals with the ugliness of that. Ever wanted to see how fearsome Darth Vader was in his prime and how outmatches the rebels were before Luke showed up? Rogue One absolutely gives you that. 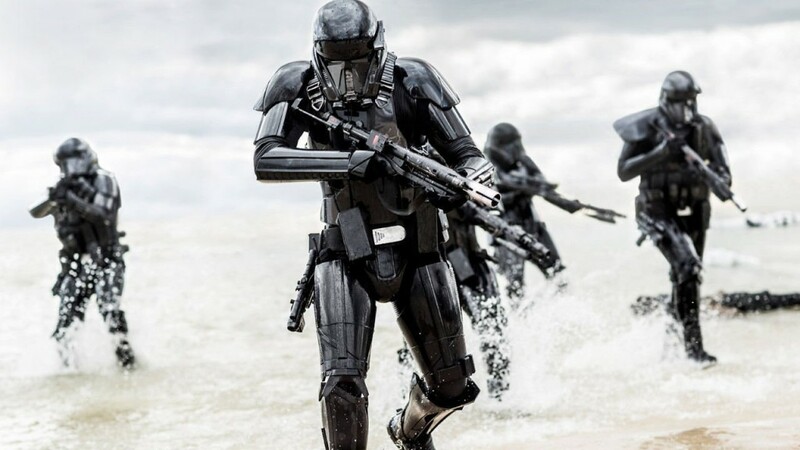 Where the economics of Hollywood storytelling left the main saga with little but the flashpoints of the conflict; Rogue One submerges itself in what it’s like to live in a galaxy ruled by fascists. Not that there’s anything political about that, Disney insists. It certainly helps that the talent involved is so strong. Though dogged by rumors ever since the reshoots, Gareth Edwards’ direction proves to be the right tool for the job. The final space battle sequence does drag a little, but there’s little else in the film that suffers the same fate. Every location and scene has room to breath but rarely outstay their welcome. What’s more, the film’s final battle may go down as the best battle sequence in the franchise to date (for reasons best not spoiled). Similarly, Michael Giachinno does a great job of building on the musical footnotes left by John Williams’ work in previous films. It never feels like its not “Star Wars” and it always feels like an installment of the series that would only ever exist in the minds of fans – and the score riffs off that. but then that’s kind of the point. She’s grown up in a world where the cruelty of the empire has directly shaped the course of her life and it’s dominion has gone practically unchallenged. The narrative arc plays things smart by anchoring itself to her relationship with her father (played by the ever-suave Mads Mikkelsen) and by the time she eventually makes her big pivot, it absolutely feels earned. It’s easy to imagine a version of this film where little effort was put into the cast outside of Jyn but every player here has their moment. Diego Luna and Alistair Petrie make the case that the rebellion can be every bit as ruthless as the empire, even if their motives remain good. Donnie Chen and Wen Jiang further diversify the rebellion here, with the former bringing a unique take on Force Sensitivity to the fight while the latter packs heavier, more conventional weaponry. Meanwhile, Alan Tudyk brings a whole new kind of funny droid to the series as K-2SO and Ben Mendelssohn hits all the right notes as the smug villain of the piece. The only character who doesn’t really get his due is Forest Whittakers’ Saw Gerrara. Conceptually, his role as a rebel too extreme for the rebellion is really interesting but he never really gets the screentime to do it justice. Regardless, by the end, the crew of Rogue One don’t just feel like another band of plucky rebels – they feel like your band of plucky rebels. For the second year in a row, Disney have showcased their uncanny ability to deliver exactly what Star Wars needs to play in today’s Hollywood landscape. If The Force Awakens was a statement that read “Star Wars Is Back”, Rogue One hints at what it could become. It’s a new installment of Star Wars that puts the sometimes-corny mystical aspects of the series in the rear-view mirror and invites you to enjoy a story that, while removed from them, remains as engaging as the franchise gets. It’s an effort that shows that Disney, while unafraid to indulge in the nostalgia surrounding the property, are game to rework and experiment with it going forward. Though not flawless, it’s exactly the movie they set out to make – and what they’ve made is damn exciting stuff.